Home » Blog » O Pioneers! In 1899, the year that Commander E. D. Taussig took formal possession of Wake Island for the United States, journalist Margherita Hamm scoffed at the acquisition as a “mere dot on the waste of waters.” Early twentieth century surveys of the remote atoll revealed remains of old Japanese fishing camps and a shipwreck or two, but no evidence of permanent human habitation. Fishermen, feather-hunters, passers-by, and scientists did not stay long: with no fresh water or soil, Wake was not a very hospitable place. The first long-term pioneers were the Pan American Airways men who brought their technology and trappings to Wake in 1935 on the SS North Haven. In remarkably short time, they established a base of operations, blasted a seaplane runway in the lagoon, and hosted biweekly transpacific Clipper passengers and crews in high style at their little station on Peale Island. With the exception of their cargo transfer operation on Wilkes, the rest of the atoll was left in its native state. The day after Christmas 1940, a second group of pioneers set sail for Wake Island. These were the first eighty civilian contractors, including my grandfather, who would build a navy base on Wake. I often think of that voyage on the USS William Ward Burrows as the pioneer party left the Hawaiian Islands quickly behind and stretched their eyes on nothing but the endless sea and sky for two weeks. Long-anticipated and frequently delayed, the trip was as well planned as any could be. In Honolulu during December 1940, Harry Olson met often with the captain and exec of the Burrows as they carefully planned the future unloading sequence in the unpredictable conditions off Wake Island. Captain Ross Dierdorff’s recollections, Pete Russell’s diary, and my grandfather’s letters convey an underlying sense of mission during the voyage, though the days are punctuated with adrenalin-pumping danger (as the heavily-laden barge twice broke loose) and long stretches of boredom. Each day brought them closer to the great pioneering challenge that was just over the horizon. The pioneer party went right to work to unload the Burrows, set up their first camp, adapt the master plan to reality, and get acquainted with their curious new home – well aware that they were the first humans to set up housekeeping there. Not everyone is cut out to be a pioneer, however, and some of these first men left Wake the first chance they got. Over the coming months hundreds more came to work on Wake and the naval air station began to take shape. (Yet another pioneer group arrived in August 1941, calling itself the “Pioneer Platoon.” These were the first U.S. Marines of the First Defense Battalion who came to fortify the atoll.) On October 9, 1941, the remainder of the original contractors’ pioneer party celebrated the completion of the first nine-month contracts on Wake (for non-supervisory contractors) at a special gathering. 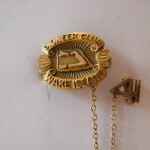 Coincidentally, the Burrows arrived that day with a load of supplies and Captain Dierdorff joined the celebration as an “honorary pioneer.” Each member of the pioneer party received a small commemorative pin bearing the raised outline of the atoll flanked by the words “Pioneer Club, Wake Island,” and a tiny chain connecting to a secondary tack, “41.” Men – even construction workers – wore ties back then. My grandfather would have attended this party and received this pin, but his, like many others, was lost in the maelstrom of war that hit Wake two months later. I am grateful to my eagle-eyed friend, Barbara Bowen, for locating one of these rare pins a couple of years ago and sharing it with me. It is surprisingly small and delicate for a big, burly construction guy, but I bet each Wake pioneer wore it with pride. For all pioneers it’s ultimately about the long term: settling in, setting your chin, fighting the elements, making do, and keeping on. But each pioneer can reach back to that initial flush of anticipation, the adventure, cutting ties, braving the future, and starting something new in a new place. It is an exhilarating feeling everyone should get to experience and embrace sometime in his or her life, no matter the risk. It is what humans do.